The trailer begins with majestic and interplanetary imagery and a narration from Seg-El (Cameron Cuffe), grandfather of Kal-El, a.k.a. Superman. While there is some imagery suggesting ties to Man of Steel and the DC cinematic universe, including the design of the “S” which in the films implied hope, there’s also a nod to a previous take on the franchise, as some bars from John Williams‘ classic Superman theme can be heard near the end. Those notes and the trailer itself seemed to elicit a positive response and applause from the audience. Even though The CW’s Black Lightning reel impressed, it was the Krypton trailer that I would enjoy seeing again and again. 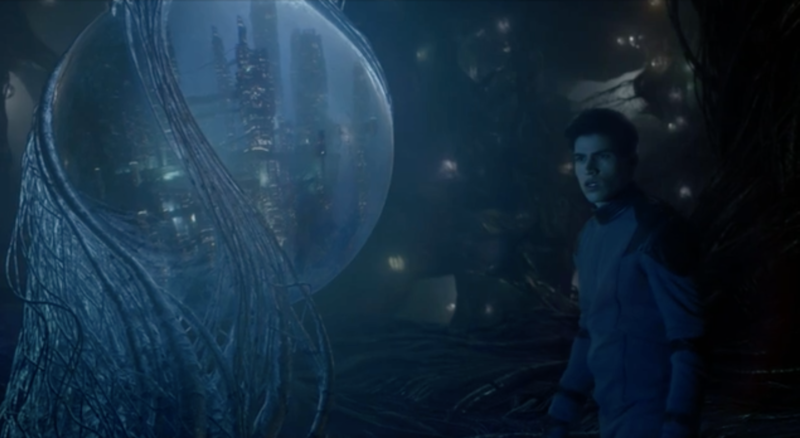 I’ll be the first to admit that Krypton as a series seemed pointless to me upon the first announcement, but the trailer changes those impressions, giving Syfy a high-concept series with an impressive look in an immersive world. I admit I’m curious how these visuals will translate on a weekly basis, but at this point, Krypton looks like a cinematic experience. Likewise, Cameron Cuffe as Kal-El’s ancestor Seg-El gives a strong performance in the scenes we see, providing the show with a powerful protagonist. I will admit as a fan of several other current DC TV shows, it’s a little bit jarring that Seg addresses his grandson in the voiceover, and not his granddaughter who currently stars in her own series on The CW; then again, we might be talking about a universe here where Superman is truly the Last Son of Krypton. Warner Bros. and Syfy have not yet released an official trailer for Krypton, though that may change after the show’s panel on Saturday, July 22.